Enterprise Systems recently embarked on an innovative and unique marketing approach to get integrated with the thriving SMB market. 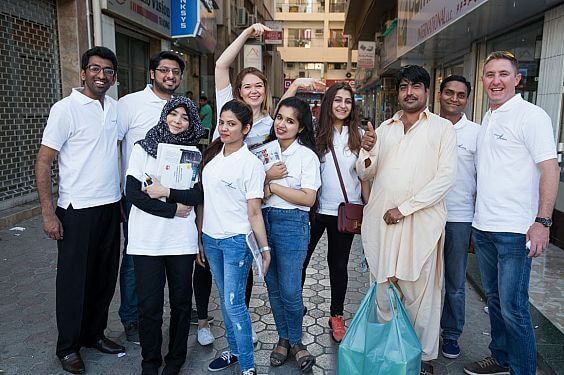 In a space of three days, teams from Enterprise Systems mapped the entire Bur Dubai IT market, engaging in an extensive door-to-door awareness roadshow. The staff were divided in four teams of three, comprising a sales member, a technical member and a promoter. The team were decked from head to toe in Enterprise Systems branding. The IT market in Bur Dubai comprises of 600 stores or so, with the Enterprise Systems teams managing to reach a remarkable 400 plus stores in the three days. Apart from engaging with the resellers, the exercise enabled Enterprise Systems to create a database as well as significantly raise awareness for Enterprise Systems and Huawei. “The idea behind the campaign was to get as many resellers in the market aware of the Enterprise Systems name as well as the Huawei brand they represent in the Middle East region,” explains Pouya Parsafar, managing director, Enterprise Systems. Second was to personally invite the resellers to a lunch hosted on the 24th of April in Bur Dubai by Enterprise Systems with support from vendor partner Huawei. The Value-Added distributor wanted the resellers to understand why they should attend the event. The incentive, Parsafar says, is the strength of Huawei brand itself, which they got to know better as well as meet the principal. The lunch, served at the iconic Signature by Sanjeev Kapoor restaurant at the Melia Hotel, proved to be a remarkable success. Turn up was over 170 guests, beating expectations. At the event, there was an introduction to Enterprise Systems by Parsafar, who highlighted the equally remarkable journey of Enterprise Systems to become one of the leading Value-Added distributors in the Middle East. Hongyanbo from Huawei familiarised the audience with the brand before Mujeeb Ahmed, Senior Systems Engineer with Enterprise Systems, gave a detailed technical presentation about Huawei products. An interactive Q & A followed soon after. The audience was very curious about Huawei since there was limited awareness of Huawei Enterprise solutions in the SMB market. Hongyanbo, channel manager for Middle East Huawei Enterprise Business Group, said the SMB push by Huawei is new in the Middle East. The brand focused on major enterprises and the middle accounts since the beginning so as to build the brand and awareness in the market. Across the product line, Huawei offers entry-level and mid-level products with routers and switches that can satisfy the SMB market in networking servers in IT and unified communications and collaboration solutions for IP telephony. “We have the good products that have already been tested and proven in the big and medium accounts. We believe the quality and pricing and the technical service ability that we have gained from that segment, can be applied to the SMB market,” Hongyanbo said. The SMB Market size is huge and will continue to grow vigorously in the upcoming years; so the potential is there, Hongyanbo says, the issue being how to penetrate the market. This is why Huawei is keen to make inroads into this market through Enterprise Systems, Hongyanbo says. Parsafar concurs, saying the SMB market could potentially equal or surpass the project and the enterprise business for Enterprise Systems. The feedback from the market was very positive, says Parsafar. There was limited awareness of Huawei Enterprise and its solutions in this specific market, with most focusing on legacy networking brands. “Everyone in the market is ready for a new brand and are ready to play with a new player,” says Parsafar. “The resellers want to know about support, services and pricing so we can address every single point to make sure that we are successful in this market,” he added. Hannah Khan, marketing manager at Enterprise Systems and who launched the campaign said, “It was a completely new experience for the whole team; the door-to-door activity was very interactive and hands on, and this proved to be the most effective way of building awareness and relations within that specific market. There is a huge potential in the SMB market, and we expect a prosperous future within the segment,” she added.